Last year was a difficult one to call for semiconductor revenue but it has also seen a lot of changes in FPGA land. I don't need the assistance of a firm of accountants to work out that Xilinx topped the rankings for FPGA billings during 2016. This is no surprise as Xilinx has been at the top for well over a decade now. As I discussed in my previous column, 2016 was a difficult year to call for semiconductor revenue, with the final consensus being that the market managed a modest increase. In calculating these numbers, I have made adjustments for sales of items such as CPLDs, ASSPs and power devices, but included software and IP. So, my take is that FPGAs outgrew the overall semiconductor market (6% vs. 1.5%). I didn't find any significant shift in market share, although Intel CEO Brian Krzanich claimed that Altera had taken share. In fact, what surprises me more is that Xilinx is not drawing away fast. The headline grabbing "largest-fastest-latest technology" parts are also the highest priced devices. Xilinx has beaten Altera to the last three nodes, with more than a one-year lead to 16/14nm technology. I expected this dominance would drive more design wins and therefore revenue. Admittedly, these high-end devices tend to be reserved for exotic applications in ASIC emulation, communications or the military, but these are the families that move the needle the most. The design-in time for complex FPGAs is getting longer, but I'd expect ASIC emulation to be early to market. Emulator companies have to build a complex software environment that can partition ASIC design into manageable chunks and then pass the design to the vendor tools. This is no mean feat, but they don't need to verify a design and integrate it with software, as that is down to their end-customers. Communication applications are more involved, and take longer to get to production status, with military applications typically taking longer still. Thus, it may be that added revenue acceleration from Xilinx will begin to appear in the next few quarters. I guess that it is a bit early for Altera to reap many benefits of being part of Intel. Everyone knows that Intel is intent on retaining its supremacy in the data centre by leveraging FPGAs for acceleration. The flip side could be that Altera has less attention for other markets—only time will tell. 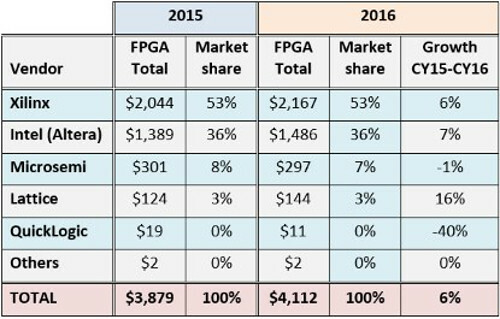 I have a suspicion that my analysis of Microsemi underestimates its FPGA revenue, and the Lattice numbers may be too high. Neither company breaks out their numbers on a regular basis. Microsemi has a sharp focus on the security aspects of FPGAs in defence and aerospace which take a bit longer to design-in, but the projects stay in production for more years. Microsemi would benefit more than most from the proposed boost in the U.S. defence budget. Some of the Lattice products get used in consumer applications, which are characterised by a rapid ramp up to high volume production with an equally steep decline. Lattice also has a strong offering in mid-range families. To round out the numbers, QuickLogic has seen a dramatic fall-off in revenue as its business is so heavily driven by a few projects in Samsung. The CEO still hopes that the company will break even by the end of 2017 to halt a long string of loss-making quarters. My guesstimate of "others" includes Achronix, which is still VC funded and so does not report its results. But wait... what is the winner of "Best FPGA of 2016"? Well everyone will have a different interpretation of what factors make a product "best," but—for my money—the most complex FPGA family rolled out last year has got to be the Virtex UltraScale+ family. That said, heaven only knows how long it will take a team to design and verify a device boasting 2.8M logic cells and 96 transceivers or the MPSoC with multiple processor cores supported by 600k Logic cells. What about you? Do you agree with my suggestion, or do you have your own suggestion for Best FPGA of 2016"? Paul Dillien is principal at High Tech Marketing. First published by EE Times.